This is a quick vegan weeknight dinner recipe. This healthy recipe is hearty you won’t even realize it’s vegan. First cook your pasta according to the package. Heat up 1 Tablespoon of olive oil in a large skillet over medium high. Place the slice mushroom in the hot skillet and season with 1/4 teaspoon salt and 1/8 teaspoon pepper. Saute for about 2-3 minutes or until the mushrooms are softened. 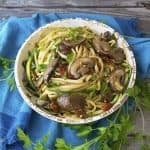 Add the zucchini noodles to the hot skillet and cook for 1 minute. Pour the pasta and sun-dried tomato pesto into the hot skillet and stir until thoroughly combined for about 1 minute with the heat on. Turn off the heat and serve with whatever garnish you like! Feel free to add more pesto if the pasta seems dry!